Home » Blog » Which Is More Important, Health or Wealth? Health and wealth are both very important concerns as we age. As a wealth management firm here in Bloomington Normal, we are focused on the financial side of a successful retirement. And we are very good at planning for those needs and goals to ensure the safety of investments against a variety of threats. However, many people would argue that health is even more important than wealth in a person’s senior years and lack of planning in this area could derail a successful retirement plan. These were the stern warnings of Dr. Robert Brown, Owner of Elite Chiropractic and Rehab. He is uniquely qualified to back up his warnings, as he is also a Certified Public Accountant (CPA). 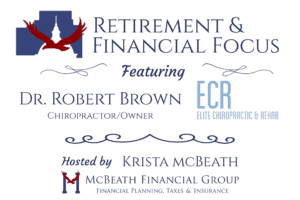 As a featured guest on Retirement & Financial Focus, Dr. Brown will explain how investing in health is critical to our financial success in retirement! Every month, Krista McBeath hosts a new McLean County professional to share retirement and financial knowledge in a weekly question and answer segment and we are proud to feature Dr. Brown in our discussions on the topic “Which Is More Important, Health or Wealth?” Watch the video by clicking here! Please join us for next week’s segment and learn What is the Best Protection Against Costly Medical Expenses in Retirement?